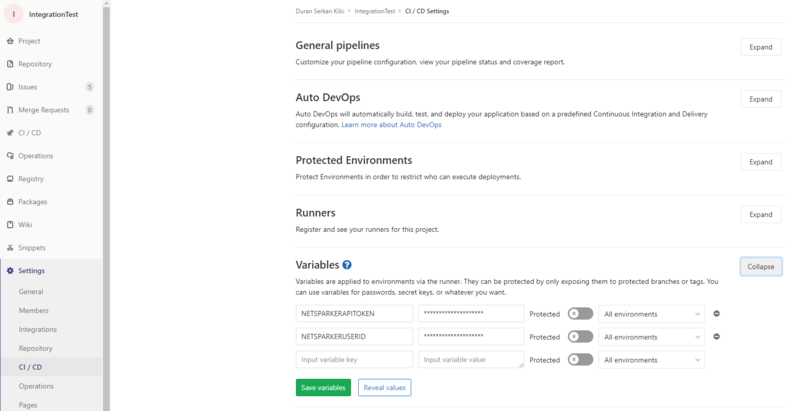 GitLab is a web-based Git repository manager that provides CI/CD pipeline features, enabling you to add CI configuration to your source control repository using just one file. You can integrate Netsparker Enterprise with GitLab using cURL or PowerShell scripts, generated by our Integration Script Generator. This topic explains how to generate and use cURL scripts to integrate Netsparker Enterprise with GitLab in order to enable our advanced integration functionality. Netsparker Enterprise uses cURL and PowerShell command-line tools to integrate with GitLab. These scripts have been tested and approved for GitLab version 9+. In order to integrate with Netsparker Enterprise, GitLab Runner’s execution environment must support cURL or PowerShell. From the Continuous Integration Systems panel, click GitLab. The GitLab Integration window is displayed. Paste the copied script (from the previous How to) into your .gitlab-ci.yml file, as shown in the example. Then commit and push it to the Git repository. Navigate to your GitLab Project window. Click Settings, then CI / CD. Expand the Variables section. Add your Nesparker Enterprise API credentials as NETSPARKERUSERID and NETSPARKERAPITOKEN variables.